Everyday I am rewarded by the number of people who read my posts. I am thankful my experience of the mother of an extraordinary teenager can perhaps help others. I have been told a number of times there are lots of stories about younger children with down syndrome but not as many about teenagers. I believe in my message. I want to share our story. I believe our unexpected birth happened for a reason. The tools and resources we used to help us embrace this awesome daughter can help others. I do not mean to sound like I know the answers, or any answers, but I know we are a resources, just like thousands of other families before us. I know one of the greatest gifts we have been given is our daughter, Alex. She is the magic I never knew I needed, the light that shines bright is our lives. 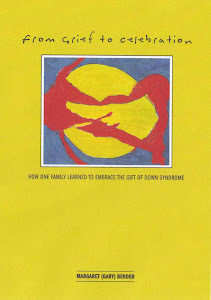 I am honored to share our story, "From Grief to Celebration, How One Family Learned to Embrace the Gift of Down Syndrome" as a resource to help others embrace, understand and learn. Recommendation for a GREAT book! I want to share my book, the message of life and love, challenges and triumphs. It is our world and our truth. This book could help families, educators and professionals. It is a book about resources, acceptance and awareness. To that end I would like to give away two copies of this book on Friday, February 25th. Share this post with others and grab my button. The code is just a simple copy and paste exercise located on the sidebar. Thanks for helping to spread our message of belief. PS - I will also donate five copies to five seperate parent groups, educational organizations and professionals - just send me the information! I believe in your message too! 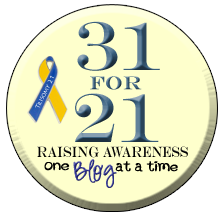 There are so many blogs that feature young kids. And I love them all. They are dealing with the same things I am right now. But I love your blog, because it makes the unknown down the road much less scary. School, peers and their attitudes are my biggest worry. And while there will always be challenges, I rejoice along with you for all of Alex's triumphs! You should send one to the Down Syndrome Association of King County in Washington state! They have a "sharing library" and would definitely benefit very much from your book & insights. :) Wonderful thing you're doing here! I don't have an address for them, but you can contact Louise Avery via contact@downsyndromecommunity.org.